Facebook, while valuable to brands of all sizes, is especially beneficial for local businesses. Over the years the social network has provided local business owners with tools and features that make it easier to communicate and reward existing customers while attracting new customers. Likewise, Facebook has also made it possible for consumers to share feedback — in the form of reviews — about the local businesses they visit. Currently customers can leave a five-star rating and a review on a local businesses’ Facebook Page. Although these reviews are visible to anyone who visits that page as well as in the News Feeds of friends of the author, business owners could only respond by using their personal profile. However, that’s about to change as the company has confirmed that it’s rolling out the ability for Page admins to respond to public reviews as the Page itself. This creates a lot of opportunity for consistent engagement from the brand. For example, Page admins can now respond quickly to negative reviews, as well as thank customers for positive feedback. 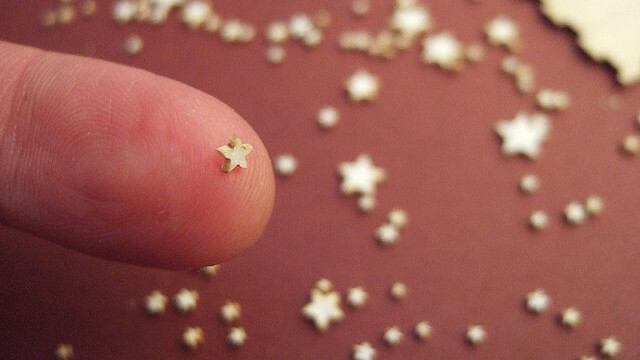 In doing so, you give visitors more incentive to rate your page. Why is that important? Because star ratings lead to greater brand awareness as Place Pages become eligible to appear in News Feed and help others discover a business they didn’t know about previously. According to a Facebook spokesperson, the reply functionality might not be available to every local business immediately. The company is rolling the feature out slowly and expects it to be fully operational in the next couple of weeks. In the meantime, let’s take a look at some of the other features available to local businesses on the social network. Promoted or Boosted Posts let you add a budget to a new or existing post so more people who Like your Page and their friends see your message. In turn, your posts will be visible to more people in desktop and mobile News Feed which will help reel in more Likes, comments, and shares. This can be done directly from your Facebook Page, making it a popular choice among marketers. 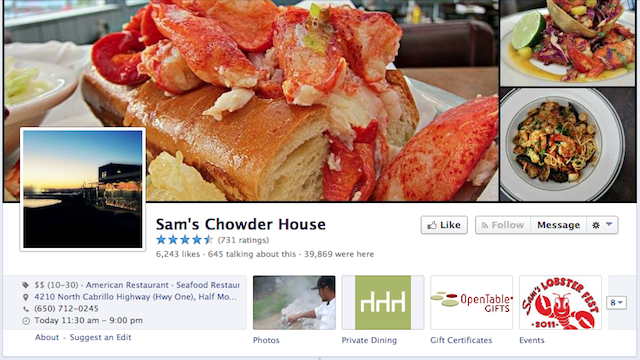 Let’s take a look at Sam’s Chowder House in Half Moon Bay as an example. The seafood restaurant wanted to spread the word about its business among potential customers, hoping to become a destination for people living nearby. Its solution? Promote posts several times a week featuring photos of its most popular dishes. As a result, Sam’s Chowder House saw a 19 percent increase in monthly guest count and gross revenues, a 160 percent increase in weekly reach after just two months, and a 25 percent increase in fans just after two-and-a-half months. The day after the most successful post was promoted, the restaurant had a 22 percent increase in guest count and a 58 percent increase in sales. 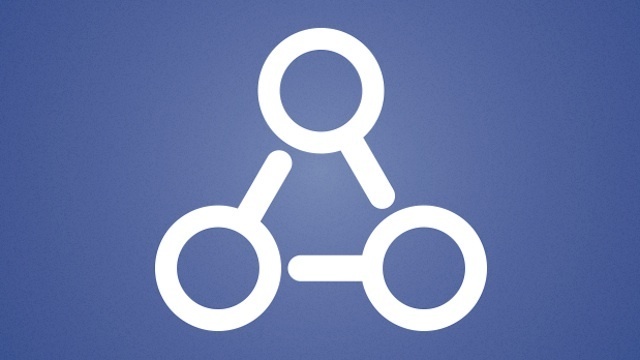 Introduced in January 2013, Graph Search lets people use simple phrases to search for people, places, and things that match specific characteristics. For example, someone could search for “dentists my friends like” or “restaurants liked by vegans in San Francisco” to find local recommendations. Although there are some limitations to the functionality, Facebook announced a powerful upgrade this past October that enables members to search status updates, comments, and posts. So even if consumers are Liking or reviewing many local businesses, any mention of your business within their posts or comments are still searchable. So instead of looking for friends in Chicago who like Giordano’s, someone can search for friends who have written about deep dish pizza or mentioned it in a comment. This makes Facebook an attractive option for people looking for real-time conversations about local businesses and interests. Currently businesses, brands, and organizations can share discounts with their customers by posting an offer on their Facebook Page. When an individual claims an offer, they’ll receive an email that they can show at the Page’s physical location to get the discount. Offers are currently free, but you can pay to promote your offer similar to how you’d promote an individual Page post. Local business owner Tara Koenig wanted to spread the word about her homemade treats, bring Charlottesville residents into the store and keep them coming back. 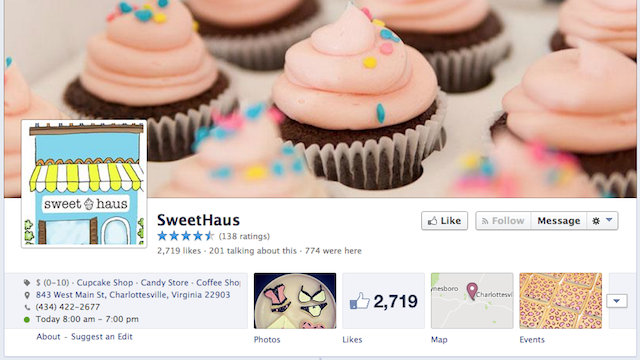 To do so, Koenig launched her Facebook Page even before her business, SweetHaus, officially opened its doors. She used the page to share specials, photos of products, and information about local events. Through Facebook Offers, Koenig received more than 1,000 claims for a 12 percent redemption rate in a city of only 75,000 people. Additionally, Page Post Like Ads help her grow her audience to 2,444 engaged fans with a 15 percent increase in Page Likes in just two weeks. The concept of checking in to a location isn’t new, so we won’t spend much time on it. However, we will say that the more a person engages with your business on Facebook, the more awareness it’ll create for your business. For example, if someone checks in at your restaurant, his or her friends will see that update in News Feed. If a friend comments on that story, there’s a chance that his or her friends will see that activity, as well as the original check-in at your venue. The same goes for reviews and ratings. These stories can also appear in News Feed accompanied by your Page’s cover photo. It’s also worth noting that reviews and ratings are made prominent on your business’ mobile Facebook Page. For this reason, it’s important that you choose an image that’s consistent with your brand and appropriate for appearing on many different-sized screens. Image choice is critical for local businesses as Facebook has found that consumers turn to mobile for actionable information so they can make decisions on the go. However, none of this matters if you don’t learn to maximize your visibility through engagement and interactions on Facebook. The first thing to do is claim your Page if you haven’t already. From there, you’ll want to make sure that all of the information about your business, including location, hours, and description, are up to date and updated regularly. Once the housekeeping is out of the way, focus on sharing content that encourages action, whether it be making a reservation, leaving a review, or coming in to check out a new product.